What is required for Jackmail ? How to download and install Jackmail ? How to create and send my first campaign ? Jackmail is a WordPress plugin used to send newsletters to your contacts. It integrates contact manager, EmailBuilder, behavioral tracking and a professional SMTP server. Once the plugin is installed, a new menu will be available, simply called “Jackmail”. From this menu, you’ll find everything you need in order to launch your 1st campaign. 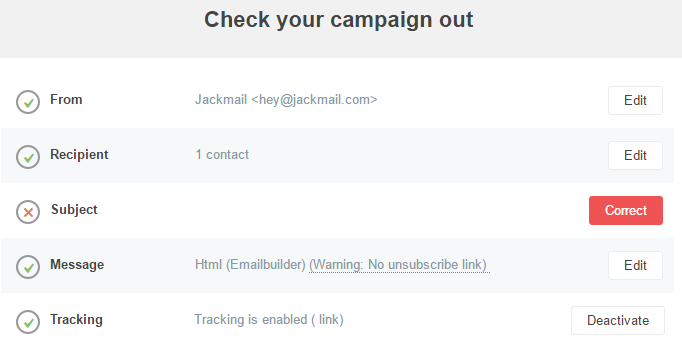 By default, the Jackmail will guide you to a dashboard, letting you see the last campaign you sent, and how to set a new one. Campaigns ->All the campaigns you have sent are stored here. You can start from scratch or edit a previous one and launch it again. Or configure automatic campaigns with triggers you have decided. Lists -> Create lists of contacts and manage them in this section. Templates -> Find you templates, and a gallery of free templates we’ve made for you. Use them as long as you need. Statistics ->What’s better but to know if your campaign have an impact ? You’ll know who opened and clicked on each mail you have sent. Account -> Everything about your account will be right here. From your details account (contact information, bills etc) to your subscription package with Jackmail. Settings -> Change language, edit connectors, customize domains, trackings… This sections offers you more freedom. 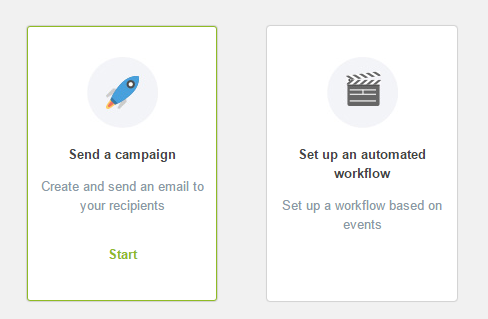 When you want to send a campaign, select the “Send a campaign” button, and let you drive through our extension. Then, pick a name for your campaign. At this point, you now have to import your contact (List, manual entry, copy/paste or import a file). This step can be done before in the “List” menu. Jackmail can be connected to plugins like Ninja Form, or can be plugged to your WordPress contact list. All your lists will be cleaned by our plugin (badmail, duplicates, misspelled…) so don’t bother with that anymore. Now that you have your contact list, we just have to go through our EmailBuilder. Jackmail have an easy-to-go, EmailBuilder. All you have to do is to drag and drop content and blocks on the right side, to your editor on the center page. Its builder allows you to create from predefined (and customizable) templates made by Jackmail or to create from scratch, your own, like a grown-up adult ! Enjoy creating beautiful newsletters without having to code responsive settings, cause it’s all in ! You picked your contact list, you’ve done your message, it’s time now to check and send. On the last screen Jackmail allows you to check if everything’s ok and suggest you to correct in case if something’s missing. Everything’s alright ? Try to send (or to your coworkers) a test ! And then, choose to send it right away or to schedule the campaign. It’s up to you.